Space Safety » Archive » Space Disasters » Close Calls » ISS Ammonia Leak, a False Alarm? A potential emergency situation developed on the International Space Station (ISS) today with a suspected case of ammonia leak in the American segment. Mission controllers in US and Russia worked together quickly to move the American and European astronauts to the Russian segment, where the crew is currently safe. The atmosphere inside the station is currently stable, with acceptable levels of pollutants. According to the space station update from Johnson Space Center, around 3am Houston time, an alarm indicating increase pressure in the coolant loop went off in the US segment of the ISS. The alarm could be indication of an ammonia leak, so the astronauts responded by following emergency procedures. They donned masks, moved to the Russian segment and sealed off the US segment by closing the hatch. Reports from JSC stressed that there is no hard data yet to indicate an ammonia leak. It could well be a faulty sensor or a problem with a Multiplexer-Demultiplexer (MDM) computer relay box. ISS uses about 50 Multiplexers-Demultiplexers (MDMs), which are computer boxes housing a stack of avionics cards. 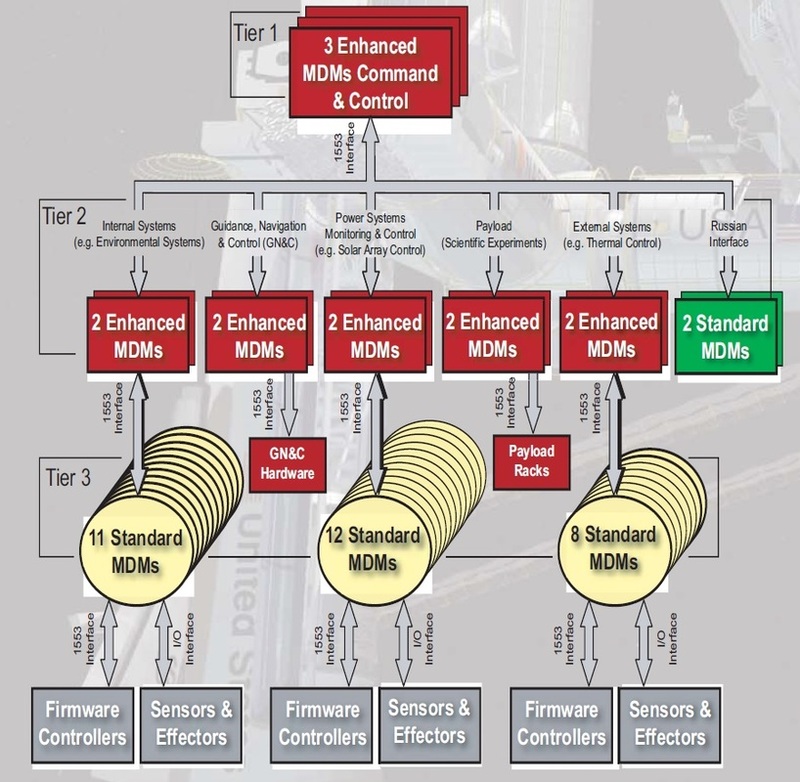 The MDMs send and receive multiple signals and data streams between the ground and ISS, between ISS control systems and Station hardware, between crew interfaces and all types of hardware, including payloads and systems components. ISS Control System Architecture. – Credits: NASA. Spacecraft communicator Jim Kelly later spoke to ISS commander Barry Wilmore, assuring that the data pointed more to a sensor issue that tripped the alarm rather than an ammonia leak. In the unlikely case it is confirmed as an ammonia leak, it will be the first catastrophic situation on the ISS. The crew, who has provisions on the Russian segment for a week or more, would have to be evacuated from the station. Ammonia, a pungent, colorless gas, is used in the station’s cooling system, regulating heat through pipes and exchangers on the exterior. Ammonia is extremely toxic when breathed and could wreak havoc in the confined environment of the ISS. Ammonia exposure causes respiratory distress, skin and eye irritation or severe burns. In May 2013, astronauts resolved an ammonia leak on the station’s exterior by replacing a pump controller box during a spacewalk. Loss of ammonia would have affected the cooling capacity of the station but posed no immediate danger to the crew inside. NASA described the crew as ‘a big, happy family’, despite all six members being confined to the Russian segment. The astronauts will spend the remainder of the day in the Russian segment. At the end of the crew day or tomorrow morning on the ISS, once the absence of a leak has been confirmed, they will open the hatch to the US segment and resume normal operations.